As both the strongest general and one with crucial and powerful cards at common or lower Ragnora is an ideal budget general. With most of the core combo intact the decks main win condition the much hated ripper combo, casting greater fortitude on an active ripper for 10 damage. Otherwise the deck aims to out value the opponent with incredibly efficient and powerful cards like lava lance, young silithar, and ragebinder. Together with the powerful yet underplayed insight as spirit and mana efficient draw this deck is a very powerful budget option. Easy upgrades include egg morphs over repulsors for a flexible hatch and removal tool or the classic makantor over alphas. If you can’t afford (lol) some of the common cards consider hailstone golem over veteran silithar or bloodtear alchemists over raptyrs. A budget version of classic Eggmar with a more aggressive playstyle. Who says you can only play Decimus in Starhorn decks? Ripper? Decispikes? Double the cancer! 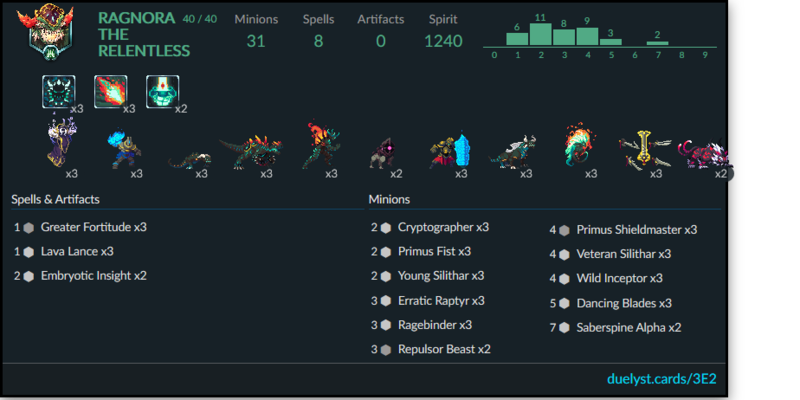 Wanderer Ragnora list piloted by Ryvirath in the playoffs of the Meltdown League. Eggmar list piloted by Grandmaster Zabiool in the playoffs of the Meltdown League. A grow deck that uses Moloki Huntress and Oropsisaur to create a powerful board in tandem with Verdant Fulmination and Godhammer and relies heavily on growing rippers to win. Wanderer Ragnora list piloted by Grandmaster Meziljie in the playoffs of the Meltdown League. Because even budget Rag is broken.